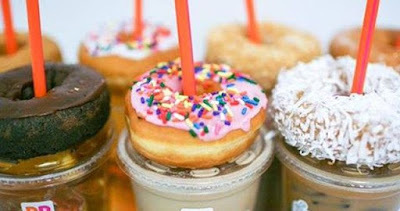 Like rival Krispy Kreme, Dunkin' Donuts will also be celebrating National Donut Day with a free donut, but only with the purchase of any beverage. The offer is good at participating Dunkin' Donuts across the globe on Friday, June 3, 2016. The free donut can be a classic donut of your choice, while supplies last (Fancies, Squares, and Croissant Donuts are excluded from the deal). The cheapest drink available at Dunkin' is typically a small coffee or tea for around $1.50.